Task-tracking systems are more fuss than fun, always more trouble than they’re worth to me. But my new job is an hour away, driving there devours my spare time, and it’s harder to make myself do anything when I get home. Help! I need something fast and easy that won’t eat more time, entertaining enough to be painless. “Free” is good too. Enter HabitRPG. Wikipedia calls it an “online time management application” but I think it shines as a motivational utility. It’s a tool that uses gamification techniques to discourage your bad habits, encourage the good, and reward you for completing projects. RPG means Role Playing Game, but HabitRPG isn’t a shared fictional narrative like Dungeons & Dragons or GURPS. It uses game reward techniques instead of actual gameplay. How does it work? You start by setting up your account and designing your cute little avatar, picking hair and skin color and a few other options. Then you enter the things you’d like to track, divided into Habits, Dailies, To-Dos, and Rewards. Their category determines how they’re tracked and rewarded or punished, in experience points and in-game gold and silver. Habits are things you might do several times a day, positive or negative. You might enter a snacking habit, and click the + when you eat a healthy snack, and – when you eat junk food. If you don’t snack at all, it doesn’t affect you. Some habits will only be positive, like exercise, and others only negative, like smoking or making rude remarks. I set up a habit for exercising for 5 minutes, so I’ll click it three times for a 15-minute session. Dailies are things you want to do once a day: taking vitamins or flossing, for instance. You can set up a task for specific day(s) of the week, assign a difficulty to it, and categorize it. In my case, there are several musical instruments I want to practice. I’m just starting out on Egyptian Nay flute (which has to be the most difficult instrument ever! ), so I set that up to practice every day, with a high difficulty. I want to play fiddle occasionally to keep my technique going, so I didn’t associate it with any particular day and set the difficulty to medium. If I have the time to play it, I get a little boost. To-dos are one-time tasks or projects, with optional due dates. You might “Write an article for LinkedIn” or “Clean out the Refrigerator”. I also set reminder To-dos with due dates to register for conventions while a discount is available, or renew my web domain. As time goes by, the potential value of your To-dos goes up and they gradually turn red to catch your attention. Rewards take the form of game equipment, like swords that increase your strength, or armor to protect your health if you miss a daily. You purchase them with game currency that you collect by completing your tasks. You can also set up custom rewards- you might decide to ‘pay’ 50 gold pieces to play a computer game for an hour or go out for a nice dinner. There’s even an app for chrome and android that you can set to monitor your time on websites and social media. If you/re working from home, you can set it to automatically punish you for checking Facebook during work hours, or reward you for time spent learning things on Coursera. 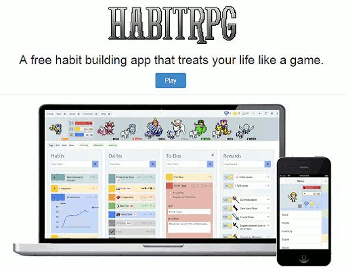 HabitRPG is free and open-source, with web and mobile interfaces, created by a dedicated crew of coders, pixel artists, designers, and writers. It’s not meant to be a complex professional system, so don’t try to use it at work to schedule your high-powered meetings and customer contacts. It’s a fun way to improve your life and reach your personal goals. How do the motivational and game reward systems work? Check out Part 2!